This post actually concerns The Telephone, to which I decided to make a small further adjustment. 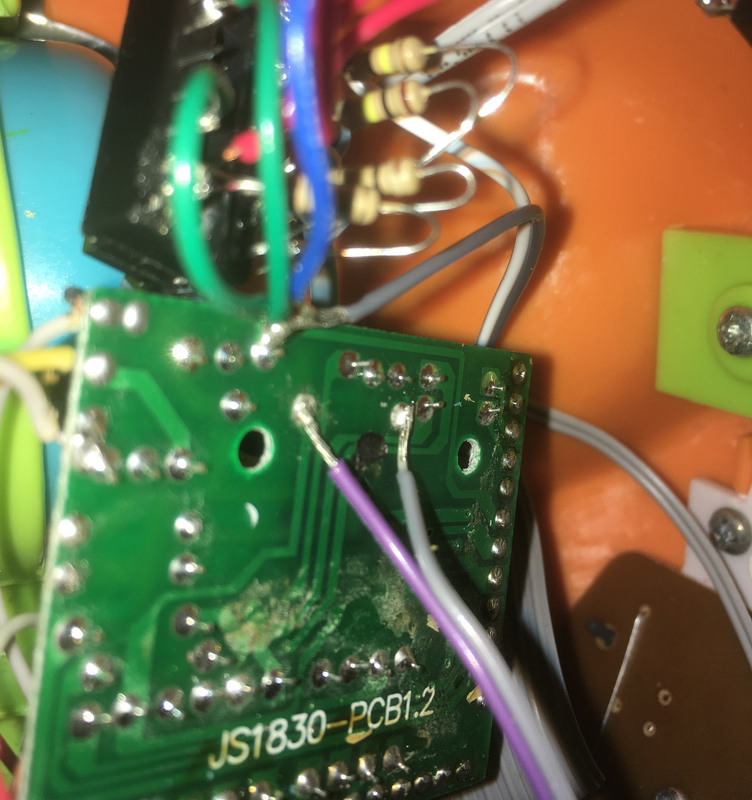 After finishing the Animal Band and The Telephone, I realised it would be a bit limiting to leave them playing in only one key, so I went back to The Telephone and searched for the resistor which controlled the pitch of the notes. 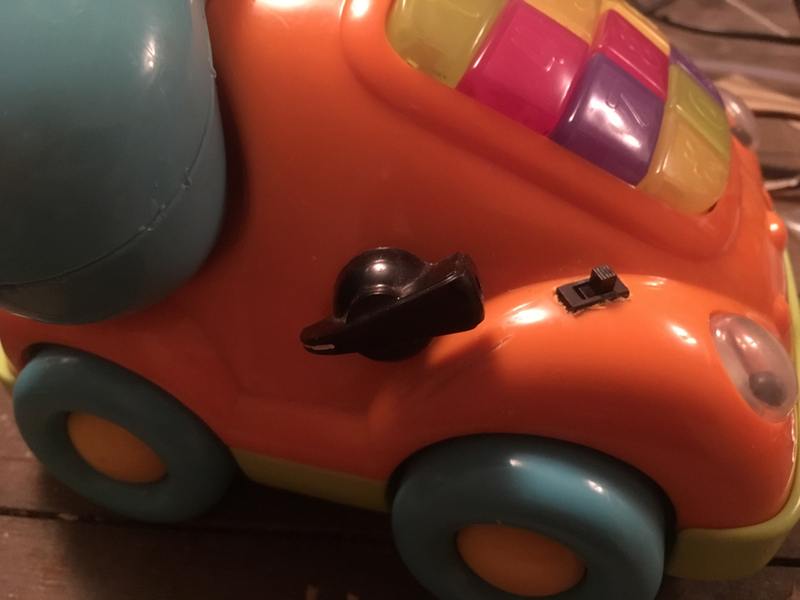 Having found it – by means of the tried-and-tested wetted finger method – I removed it from the circuit board and replaced the connection with a pair of wires. In the past I had replaced such a resistor with a potentiometer, enabling continuous – and wide-ranging – adjustment of pitch. 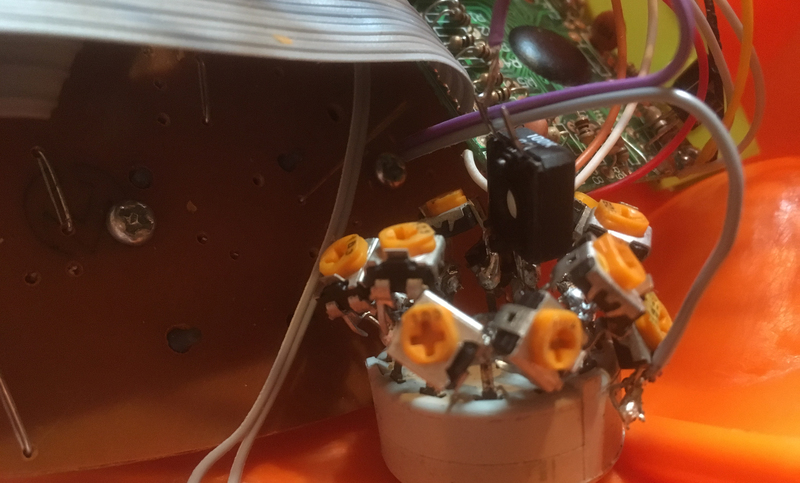 In this instance, however, I just wanted to be able to tune The Telephone to other keys, so instead of a potentiometer I added a 12-way rotary switch, the idea being to tune each step precisely to each key. The Telephone was in the key of B – B being the lowest note it would play. Rather than make this the lowest key and have all the others higher, I thought it would be better to have B in the middle, with some of the others lower, and some higher. After some experimentation, I concluded that the difference in resistance between one note and another was just a few k. I had a number of spare 10k trimmers, so decided that these could be used. I connected one of these between each of the 12 pins on the switch. The last one was connected to the circuit board on one side of where the original 100k timing resistor had been; the pole of the switch was connected to the other side, via a 100k trimmer to bring the resistance roughly into line with the original. In this way, when the switch was at position 1, it would connect through the 100k trimmer and the first of the 10k trimmers; at position 2 the value of the second 10k trimmer would be added; at position 3 the value of the second and the third would be added, and so on to the end. The way it worked, the more resistance, the lower the pitch. In the end, I couldn’t reduce the resistance enough to have B right in the middle – the device wouldn’t operate at the highest frequency required for that – so it ended up in 4th position on the switch. It was quite OK to go down another 8 semitones so that any key could be selected while The Telephone was being operated by the Bigfoot sequencer. I found a suitable knob to go on the switch, and put The Telephone back together. Enabling it to be used in any key would make it a much more versatile addition to the collection.